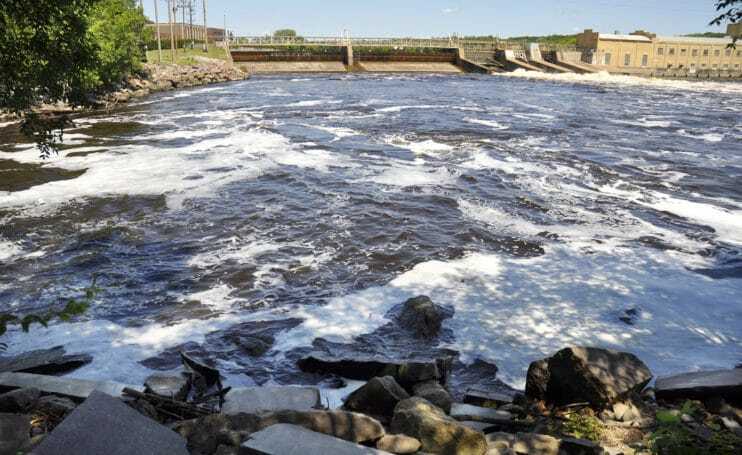 After years of planning and a red-light delay of one year, it’s now a green-light go for a water-level drawdown at Little Rock Lake near Rice and the Mississippi River north of Sartell. The Department of Natural Resources announced this week that the drawdown will take place starting on Aug. 1 and end on Sept. 15. The drawdown will involve lowering the level of the lake and river by three feet by gradually opening the hydroelectric dam at Sartell. It will affect most directly dozens of residents who live by the lake and on the river shore north of Sartell. The drawdown is expected to improve water quality in Little Rock Lake and the river, as well as give a boost to fish populations and healthy vegetation growth. For years, Little Rock Lake has been plagued with algal blooms at times so bad they pose dangers to animals and even children. By drawing down the water level, many parts of the lake (and river) will be exposed to air, killing off the bad vegetation and boosting beneficial vegetation. The drawdown is also expected to prevent future erosion problems in some areas of the lake and river. This is the first time a drawdown will have been undertaken in the area, although drawdowns of lakes, rivers, streams have been done elsewhere in the state throughout the years. The drawdown had been planned to start last summer, but in July, shortly before the start-up date, the DNR was notified that first there had to be a cultural-resource study completed in the affected area. That study involves taking into account the habitation through the history of American Natives in the area, such as evidence of artifacts and/or burial sites. The cultural review by the Minnesota Historical Preservation organization is expected to be done this summer by the end of July at the latest. The drawdown has been a topic of controversy since it was first proposed six years ago. Many informational public meetings were held in the area for input from lake-and-river residents. Some opposed the plan; others welcomed it, but gradually a consensus emerged that it is probably worth a try. The project is spearheaded by Eric Altena, DNR Area Fisheries supervisor, Little Falls office. At public meetings, Altena shared knowledge of what residents can expect during the drawdown. There will be an unpleasant odor from rotting vegetation, fishing will be allowed during the drawdown, “no wake” signs will be posted, residents will be allowed to rake the sandy area exposed at shorelines and clean-up efforts will be undertaken by volunteers. Altena also said people should be prepared to boat cautiously because there will be exposed rocks or other obstacles exposed or just beneath the water line.